Jennifer Lawrence narrates this documentary that shows us our planet as seen from outer space. 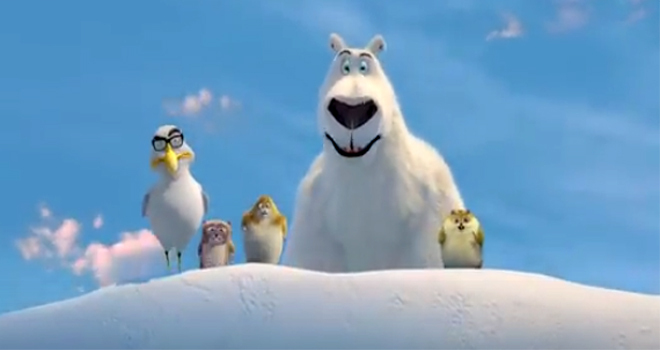 “Norm of the North” is not awful, but it is also not special, not new, not funny, and not that interesting. The script is over-plotted but under-written, with confusing detours and uneven tone. It’s as though instead of coming up with an actual story the writers tried to assemble a formula from successful animated films — Cute sidekicks! Potty humor! Evil developers who want to despoil pristine environments! Random musical number! Wise advisor! A hero who is a clumsy outsider with a lot of heart! And a rescue! However, it also includes weirdly off-key or unresolved elements. There are actual stories to be told about the damage to the arctic environment and the potential for kids to make a difference in real life, but we’re going with condo developers and corrupt officials as the bad guys? And the issue of hunting other animal characters for food is clumsily handled. Kids may be reassured that Norm does not kill the sea lions, but he is not a vegetarian. Norm (Rob Schneider, who is quite good in his best-ever movie role) is a kind-hearted polar bear from the arctic who does not fit in because he is a poor hunter and not like the others. Both of these qualities relate to his ability to understand and speak “human” — meaning English. His wise and loving grandfather (Colm Meaney) has the same gift. Norm’s arctic home is a popular site for tourists, and the animals appreciate tourism as it helps keep their home safe. If tourists want to come see the natural environment, then it will have to be kept as it is. But there is a developer named Mr. Greene (Ken Jeong) and we know he’s a bad guy because he has a dinky ponytail and yells a lot — and, of course, because he is a developer, who wants to build luxury homes for one-percenters on the polar icecap. Norm stows away on Mr. Greene’s company plane to come to the big city and stop the development. Accompanying him are three little arctic lemmings, whose primary characteristics are un-crushable resilience and public bodily functions. Mr. Greene has a head of marketing, a single mom named Vera (Heather Graham). She is not entirely sure that the development is a good idea, but she desperately wants her daughter to get into a private school for gifted children, and Mr. Greene, as a graduate of the school, has promised an all-important recommendation if the development deal goes through. (The fact that the school produced a nutty crook like Mr. Greene does not cause her to question the school’s indispensability for her daughter.) It is a shame to hear the wonderful actress Salome Jens very briefly as a corrupt official, just there to look witchy and be bribed into approving the development. It does not make much sense to try to explain the concept of distracting the populace with entertainment “bread and circuses” to children when the movie is a poor example of exactly that idea. Parents should know that this film includes action-style violence and peril, a character captured and caged, chase scenes, theme of environmental destruction, corruption, mild language, and extended bodily function humor. Family discussion: Why did Vera go along with Mr. Greene’s plan? What is the best way to protect the Arctic? How did the lemmings help Norm? 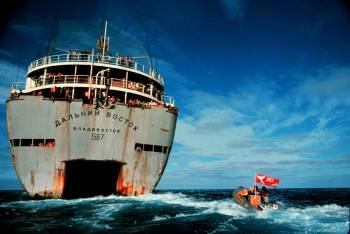 How to Change the World, the critically acclaimed, award-winning documentary, comes to select U.S. theaters this September 9, 2015 at 7:30 p.m. local time, presented by Fathom Events and Picturehouse Entertainment. The documentary looks at the very early days of the modern eco-movement. Using never-before-seen footage, it tells the gripping story of a courageous group of men and women, led by Robert Hunter, who set out to change the world and in the process sparked a revolution. The event will include an exclusive live Q&A from the London premiere event hosted by respected broadcaster and journalist Mariella Frostrup. The panel will feature legendary fashion designer and longstanding Greenpeace supporter Vivienne Westwood, director Jerry Rothwell, Hunter’s daughter Emily Hunter and other special guests to be announced. 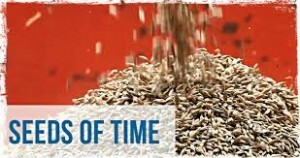 Seeds of Time is a documentary that seems like a terrifying science fiction story. It is about the efforts of Cary Fowler, funded by Bill Gates, to find, preserve, and store seeds from plants necessary for all life forms on the planet, as over 90 percent of the plant species we use for food have become extinct in the last century. For the best and worst reasons, most of our food now comes from modified plants (and the animals who eat them), created to be more efficient to grow and ship — and to be able to be patented and thus a better investment for agribusiness. Seeds of Time is in some theaters now, and anyone can bring a screening to any community via Theatrical On Demand film distribution service Gathr®, which is free if it “tips,” meaning enough tickets are reserved. I spoke to director Sandy McLeod about the film. I had been sent an article that was in the New Yorker by two friends and I was reading it one morning at breakfast. My husband was on the speaker phone and I’m reading about Cary Fowler and I hear my husband talking to a guy named Cary on the phone and I don’t really think much it. But I read a line in the article that says Cary Fowler was given $30 million to collect the seeds through the Gates Foundation and I hear my husband ask this person on the phone. How much were you given by the Gates Foundation? And I hear the person on the other end say “$30 million.” And when my husband hang up the phone I said, “Was that Cary Fowler by any chance?” and he said, “Yeah, how did you know?” So I ask my husband if he could introduce me to Cary and that summer I read Cary’s book which is called Shattering: Food, Politics, and the Loss of Genetic Diversity /. I realized that there are so many things in that book that I had no clue about even though at I’m a foodie and I know quite a lot about food, and it is of fundamental to having an intelligent conversation about the status of the food system today. And so I went to Memphis and I interviewed Cary and he really blew my mind. I realized that if this was something that people really need to know about in order to have an intelligent conversation about food and that I was going to learn along with my audience. So I felt like I was a good guinea pig for them. It’s not in this case because we actually domesticated those plants and we ate those plants and we had tremendous diversity and a lot of different kinds of fruit and vegetables that we no longer have. In fact 93% of all the fruit and vegetables that were in the United States in the last 80 years has gone extinct. So that is huge, that’s a tremendous number and with agriculture now facing so many difficulties including limited lands, limited water, low availability of fertilizers, population expansion, and now climate change, having lost that diversity means that there are less tricks in the tool bag to let genetics be able to give to the farmers to work with to have a radish that’s going to survive, to have heat tolerance or drought resistance or all the things that farmers are starting to feel in terms of what’s happening with the climate. So that loss would have continued if Cary hadn’t done what he did. It’s an ongoing battle. Seed banks are still becoming extinct and if they’re not backed up, those seeds will go with them. The scenes in the seed storage facility between Norway and the North Pole were like something out of a James Bond movie. What was it like to film there? Well, it was very cold there. It was 50 below and 30 below in the vault. and I didn’t fully appreciate what that would mean. I have a lot of cold weather gear because I’ve shot in a lot of strange places, very cold places but I’ve never really been in any place like that. It’s very other wordly. It’s ironic that we store all those seeds up there because nothing could ever really grow up there. There’s a very short season where it’s day all the time and then the rest of the year starts again and it is very, very cold. And in my exuberance as soon as I go there I wanted to go to the seed vault and I jumped out of the car and ran up the hill and found a shot that I wanted to get and I very quickly realized that my nose hurt. I didn’t have anything on my face. You have to cover everything up. You can’t really run around in those kinds of temperatures. And it was funny because when we went into the seed vault which is 30 below it actually felt really warm to me. If you decide you’re going to shoot outdoors you have to stay outdoors all day because once you bring the cameras in they have to go through a thawing process and the lenses fog up. But we were lucky in a way that we’re in a modern enough time where we weren’t shooting film, because the film can break under those conditions. Also, it’s a really expensive of place to be. All the food that’s there has to be brought in and hotels are really expensive there so we couldn’t really stay there very long but we ran around as much as we could, while we could. Your opening shot is so beautiful. It really invites you into the film even though it’s going to be a scary and disturbing stories. So tell me a little bit about the cinematography. I come from a feature film background. I used to do continuity on feature films and I’ve worked with a lot of great cinematographers. And so I’ve learned what good lighting looks like and how to frame the shot. One of the biggest problems I had on this film was that I couldn’t have the same cinematographer with me all the time. I worked with lots of different people, so I had to keep trying to keep the look unified. It was really challenging but so far most people don’t seem to notice that. And because it’s about seeds, first of all I wanted people to see how beautiful seeds can really be because they’re so tiny we don’t really look at them. These two guys in London did a beautiful book of photography on seeds and I had seen it and they let me use some of those images in the film. They’re amazing when you look at them and, they are beautifully engineered, they have incredible subtlety and nuance and diversity. So finding things like that to shoot was really, really fun and we went to a lot of great locations. Peru is a beautiful country and the Peruvian farmers are incredibly beautiful people. They dress up in their indigenous gear and they look phenomenal in the film. And we were shooting in the Sacred Valley, which is a very lush mountainous part of Peru and which is incredibly photogenic. We were lucky and the film lends itself to lots of lush imagery. How has working on the film changed the way that you shop? I eat a lot more fruits and vegetables now than I ever had and I really look for things that were unusual. I’m interested in tasting new things. I’ve always been pretty healthy eater, except probably when I was in my teens. But I appreciate diversity in the supermarket now more than I ever have and I also appreciate what the farmer does more than I ever have. I really do appreciate actually having a relationship with someone that I know who’s growing my food. It’s something really…that feels really connected to me and I like knowing what can grow seasonally where I lived and when it becomes available. Even though I live in the city, I live in a loft so I do grow some herbs on my fire escape. At least I can participate in that way and know what’s sort of growing around me. I think it’s healthier to do that. How do you think of the people who were in their 20s today see these issue different than the last generation? I have godsons in their 20s, and they are really much more interested in the land and their food, than I was when I was their age. Even though I was interested in it I was, I mean, I would go to the health food store and that sort of thing. One of them is taking a permaculture in class now. One of them has to come a really good chef and is interested in this new ideas of more nutrition per acre and how acre and how do you that instead of being so concerned about yield per acre. So I think that they are more aware because they see the issues that they’re about to confront. There are economic issues, though, too. I mean the whole farmers market phenomenon and I know that’s a certain…it has a certain…I know that Walmart is sourcing a lot more food locally and trying to make organic food more readily available. We need to have more democracy in our food. Consumers can help drive that. I know a lot of the big companies are trying to make healthier products now they see that they sell and that people are making a lot of money on this stuff. So I don’t think most people realize how powerful their dollars are and they can cast a vote on the food that they want by not buying what they don’t want to eat. And I know that their people who don’t know we have that choice because they’re in a hurry and they don’t have time to think about it. I think we should be responsible about what we do because it definitely influences the powers that be. They’re in the business of selling things and if they can’t sell them they’re not going to make them. So we can help drive that. 1. An Inconvenient Truth Al Gore’s Oscar-winning documentary makes a powerful case for the dire effects of climate change — and an even more powerful case for our ability to prevent more damage before it is too late. 2. Crude from director Joe Berlinger, shows the complexity of the legal issues surrounding international environmental exploitation. 3. Flow: How did a handful of corporations steal our water? The California drought makes this compelling documentary about corporate payoffs and abuses essential viewing. Director Irena Salina told me: “the World Bank knows how to spend $100 million but it does not know how to spend $1000 a million times. For me, that is the essence of the problem. That could not describe better what I’ve seen around the world.” You will never want to buy bottled water again. 4. Silent Running Douglas Trumbull, who created the special effects for “Star Wars,” “Blade Runner,” and many other movies, directed this outer-space story about a botanist caring for the last remnants of plant life from Earth. It features three of the most adorable robots in movie history, named after Donald Duck’s nephews: Huey, Dewey, and Louie. 5. Dora the Explorer – Save the Mermaids Even the youngest children can learn the importance of caring for our planet and there is no better way to begin than this Dora story about saving mermaid friends from a garbage-dumping octopus.